In a newly published study, researchers analyzed modern human teeth, finding that material loss protects teeth against fatigue failure. 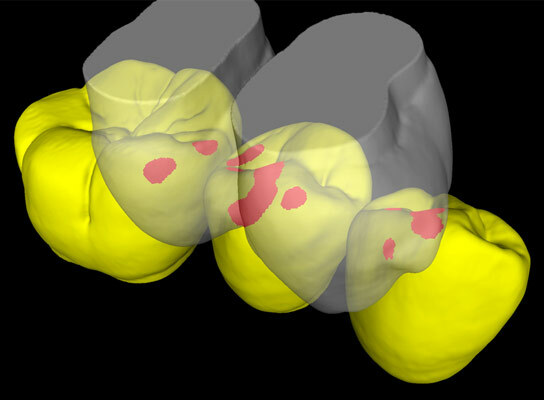 Scientists of the Max Planck Institute for Evolutionary Anthropology in Leipzig and the Senckenberg Research Institute in Frankfurt together with dental technicians have digitally analyzed modern human teeth using an engineering approach, finite element method, to evaluate the biomechanical behavior of teeth under realistic loading. They report results, showing that very widespread loss of dental material (enamel and dentine) at the base of the crown might be linked to the reduction of tooth wear in our industrialized societies. The study is published in the professional journal PLoS ONE. Our teeth are important and expensive for us. In this respect aesthetic aspects are of major interest. A healthy dentition should show shiny white tooth crowns and possibly no occlusal wear. The evolutionary history of our dentition teaches us something different. Natural tooth wear as an inevitable consequence of chewing food and habitat accompanying human evolution since ancient times. The researchers used methods from engineering science (Finite Element Analysis, FEA), after applying a new Software tool (Occlusal Fingerprint Analyzer) developed in the Senckenberg Research Institute to precisely determine tooth to tooth contacts. “The computer simulation of chewing forces creates high tensile stresses exactly in the cervical areas where we frequently find tooth lesions in our teeth”, reconsiders Stefano Benazzi of the Max Plank Institute for Evolutionary Anthropology in Leipzig, who carried out the Finite Element Analysis. To investigate changes in the stress pattern in the same tooth crowns with varying tooth wear ages, two premolars were artificially abraded in the laboratory, based on their individual data of occlusal movement. So, it was possible to calculate the changes in the stress pattern, depending on the wear stage. The stress in the teeth with advanced wear shows a far better distribution of the loads over the whole tooth crown, so that the tensile stresses will be remarkably reduced. “Evolutionary factors have apparently led to a quite successful compromise between material loss and longest possible preservation of function”, says Benazzi. The extension of the lifespan and the quick changes in our lifestyle with a remarkable reduction in tooth wear present a major challenge for modern dentistry, say the scientists. Be the first to comment on "Natural Dental Wear Protects Teeth Against Fatigue Failure"